Researchers at the University of British Columbia (UBC) Okanagan have used 3D printers to make sensors for water distribution networks. The tiny devices are capable of detecting changes in the water and warn of contamination. 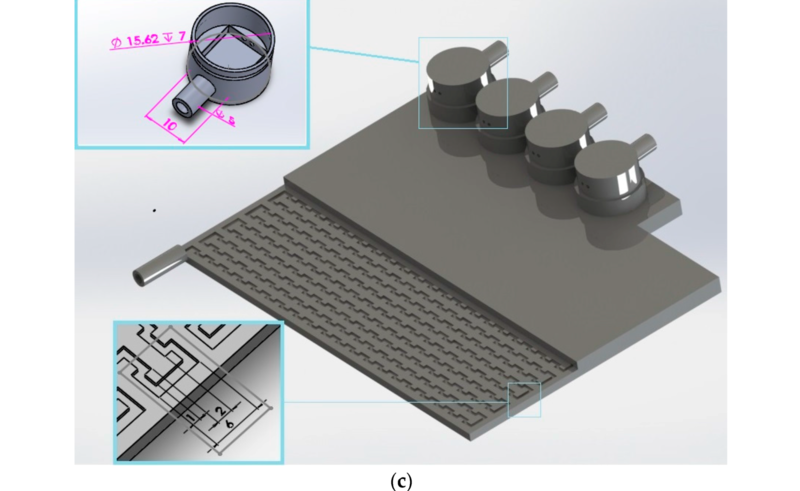 By proving a new water sensor design with 3D printing, the team at UBC Okanagan provide an inexpensive and hardy alternative to typical devices. It can be installed at every point of a water distribution network, even in the home where pressure is high. The device is designed as a simple plate with a single inlet at the bottom and four outlets at the top. When water enters into the device, it runs through a narrow serpentine channel, created using a soluble material dissolved before testing. When the water reaches the end of the plate, it passes through four cylindrical chambers, complete with sensors used to detect different contents of the water. Output chambers showing embedded sensor. Image via Sensors journal. This highly portable sensor system is capable of constantly measuring several water quality parameters such as turbidity, pH, conductivity, temperature, and residual chlorine, and sending the data to a central system wirelessly. It is a unique and effective technology that can revolutionize the water industry. The plates send water information wirelessly to a computer. The modular design also means that if one within the network stops working the others can carry on. The plates are made using the FDM technique on a commercially available Mojo 3D printer. More details of tests and fabrication can be found online in Sensors journal. Other research using 3D printing to create prototype sensors includes a study at King Abdullah University of Science and Technology (KAUST) in Saudi Arabia. The KAUST team have used the technology to make modular devices capable of triggering warnings in case of forest fires, and imminent flooding. 3D printing has also been used to make devices that actively filter out contaminants found in water. The University of Bath, UK, has been given a grant for the development of such a device, and is also involved in clean water efforts in Mexico.